The gemstone known as tiger's eye is a form of chalcedony quartz. But it didn't start out as quartz. It began as the fibrous blue mineral called crocidolite, which is made up of iron and sodium. Crocidolite is also known as asbestos. The crocidolite in tiger's eye was gradually transformed into quartz whilst maintaining its fibrous formations. Tiger's eye is what is known in mineralogy as a pseudomorph. The term comes from the Greek for "false form". Pseudomorphs form when one mineral replaces another. The transformation begins when quartz becomes embedded between the fibers of crocidolite. This process can result in two different gemstones; a blue stone called hawk's eye or the golden brown stone called tiger's eye. During the process, the crocidolite is completely dissolved. The quartz takes on fibrous formations and this creates the parallel lines within the gem, which give it that shifting play of light. Although the iron and sodium of the crocidolite dissolve, traces of the iron oxide remain and this creates the golden color typical of tiger's eye. If less iron is present the quartz will tend toward the blue color of the original crocidolite. 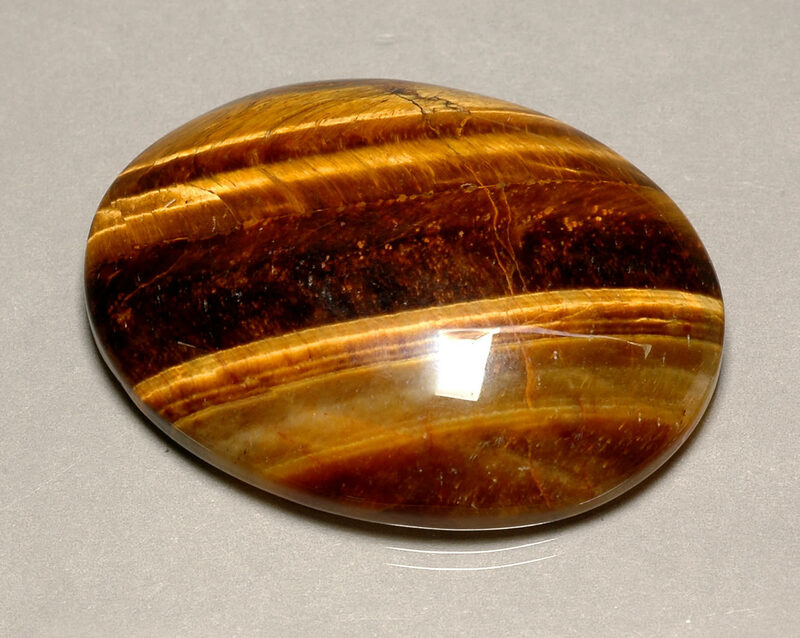 It is natural to think that tiger's eye got its name from its similarity to the eye of a tiger. If this is true, one can only assume that very few people have ever seen the eye of a tiger. The eyes of small cats tend to have pupils that form narrow, vertical slits. But the eyes of big cats such as tigers have round pupils like those of humans. Perhaps it is the golden brown color of the gemstone that led to the name. The fibers in tiger's eye may be as long as 2 inches but they are very thin. Most are only 0.001 mm in diameter. Sawing this material can be rather tricky because cuts must be exactly parallel to the fibers in order to preserve the chatoyant (cat's eye) effect. Tiger's eye gemstones are usually cut en cabochon in order to best display their chatoyancy, though you will also see faceted material. Tiger's eye was first discovered in South Africa in the early 1800s. The first theories about tiger's eye formation were developed by the German mineralogist Wilbel in 1873. More recently, a new theory of tiger's eye has been proposed that argues that it is not, in fact pseudomorphic, but rather forms from crocidolite by a different mechanism, through a series of cracking and sealing episodes. Tiger's eye is mined in South Africa, Australia, the USA, Canada, India, Namibia and Burma.